Val is on leave and last Friday we went to Johannesburg and did some research in the LDS Family History Centre in Parktown. One of the things I always enjoy when going to the LDS Family Centre is the walk through the garden between the car park and the reading room. 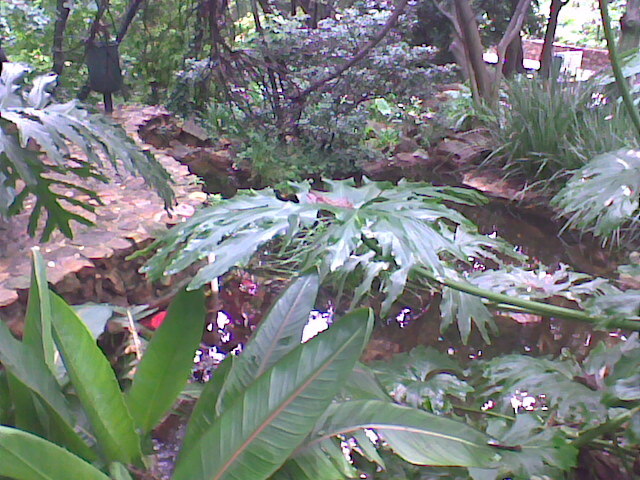 It is a pleasant place with ponds and lots of shady trees, and is especially enjoyable on hot summer days. Val was checking Methodist records from the Cape Colony, looking for the Stewardson and Morris families of Damaraland (now part of Namibia), who were said to have had Cape connections, and to have been Methodist missionaries. I (Steve) was looking at microfilms of the parish registers of Lancaster, Lancashire, England, where the Cottam and Bagot families came from. I managed to find a fair number of entries relating to the siblings of my great-great-great grandmother, Maragaret Bagot, who married Richard Cottam in Lancaster in 1835, and I’ve been reconstructing the families from the parish records. We also met Gwyneth Thomas there, who is indirectly linked to the Stewardson family through the Gunning family of Walvis Bay — John William Gunning married Charlotte Caroline Stewardson (sister of Val’s great great grandmother Kate Stewardson who married Fred Green) exactly 135 years ago today — they were married at Omaruru on 13 April 1875. Gwyneth Thomas is descended from John William Gunning’s younger sister Sarah Petronella Gunning (1845-1930) who married Thomas William Thomas in Cape Town. We’ve been trying to exchange GEDCOM files with Gwyneth, but though hers reached us OK, ours seems to get mangled in the transmission, and ends up unreadable. The past few weeks have been pretty busy with other things, and so not much time for family history. Our son Simon got a new job in Johannesburg, doing computer animation, which is what he’s really been wanting to do for a long time, and until he found a place to stay there at the beginning of the week we had to take him there and bring him home again, and in between I managed to get in some research time in various archives and libraries. I was looking through a microfilm of the parish registers of St John’s, Lancaster, looking for Cottam, Bagot and Mashiter and related families, and found a number of Bagot entries, and then began sorting them into families, and found that several of them are linked to ours. So we have John Bagot who married Dorothy Mashiter in Lancaster in 1798, and so far we’ve found six children for them: Nancy, William, Sarah, John, Margaret and Robert. John Bagot the elder was apparently a publican. Margaret married Richard Cottam and was my great great great grandmother. The surname was spelt in various ways in the records, Bagot or Bagott mostly, though in the end most of them seemed to settle for Bagot. We’ve managed to find children for William, John and Margaret. William Bagot married Ann Wooliscroft, who was originally from Derbyshire, in 1823, and we’ve found six childfren for them, though there may have been more. We’ve found marriages and children for two of their boys, Henry and John Thomas. Two of the three girls appear not to have married. John Bagot, son of John Bagot and Margaret Mashiter, was a watchmaker, and he married Isabella of Oxcliffe (where the Cottams seem to have come from). I’ve discovered four of their children, though there’s a bit of confusion about which of the grandchildre4n belongs to which. And then there is the mysterious Mary Cottam Bagot, born in Lancaster in 1838, who was staying as a visitor with a Cottam family at Scotforth in the 1851 census. She seems to suggest that there were more links between the Bagot and the Cottam families than Margaret who married Richard, but until I can find her parents it’s hard to say what it was. Perhaps I’ll have to save up to buy her birth certificate!